Annual Dance events include the Nutcracker/Holiday Showcase, the NW Fusion spring performance, our Spring Recitals and the Spring Acro Showcase. More information on these events can be found in the Dance/Performances section of our site and dates are listed on our Academy calendar. Mini Olympics is our annual gymnastics event. Complete information is available on the Mini Olympics page and dates are listed on the Academy calendar. Annual Preschool events include our September Open House Orientation, Nutcracker, Mini Olympics, Spring Dance Recital, and weekly Indoor Play Park and Lunch Bunch. More information on all of these events can be found in the Preschool section of our site and dates are listed on the Academy Calendar. Picture day generally occurs in May. Your student will be notified as to which day and time their photo session will occur. For your convenience, class pictures will be taken during regular class times. Please have students arrive on time for their class (10 minutes early for dance if possible) and looking their best on their picture day! We do try to stick to our schedule, but please take into consideration that your child might be a little late leaving class on picture day. If you have to miss the day your class has their picture taken, check with the front office. It is possible to schedule a different time during one of the picture weeks for you to come in and have your individual photo taken. Please be sure to write your actual class time and class name on the order form. Dance students need to be in complete recital costumes. Hair may be worn as desired and make up as appropriate. Gymnastics students should wear their Mini Olympics uniform. If you have purchased the shorts, you are welcome to wear those for pictures. All students should have their hair up neatly. Light make-up and hair spray is appropriate if you choose to use it. Feel free to send students with a brush/comb for touch-ups. Parent participation classes: Parents, please wear black bottoms and any solid colored top that matches your child. You will also be in the group picture. Need a uniform or costume? Don't worry – we will come up with something so that everyone can be in the group photo! If your dance costume has not arrived, try to wear a leotard or T-shirt in a color that will match. If you don't know the color of the costume, ask your teacher. For individual pictures, if you ask ahead, students can usually borrow a costume from another student. Gymnastics students will be allowed to borrow a uniform to wear for their pictures if they are not participating in Mini-Olympics. Pictures will be available 4-6 weeks after they are taken. They will be distributed in class as soon as they arrive. You may also log on to www.StrikingImage.com to view your pictures after they have been taken. You can order group and individual photos – prices are listed on the order form. Correct payment should be noted or attached to the order form and sent with your child on picture day. Checks may be made payable to "Striking Image." Extra forms are available at the front desk if needed. Please note that you will need a separate order form and payment for each class your child attends. (this mainly applies to Accelerated, Team and Performing Company Students who are in several classes or groups). Background colors will be "Photographer's Choice". You will notice on the posters that there is an option for superimposing one picture on top of another. To choose this option, you need to select "Additional Poses" on your order form. No parents are allowed in the picture studio or gym area while pictures are being taken. 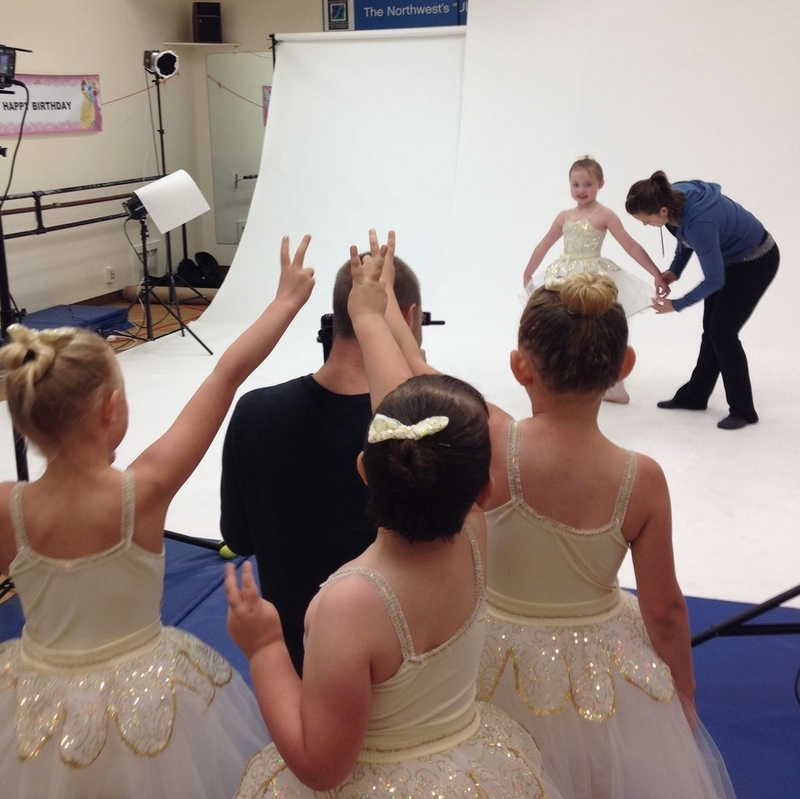 In addition to the photographer, a dance teacher and another staff person are in the photo studios to assist. Dance parents can take pictures of their child and their dance group before or after the children go to the picture studio. Gym parents are more than welcome to watch the photo session from the viewing area and take pictures at Mini Olympics.